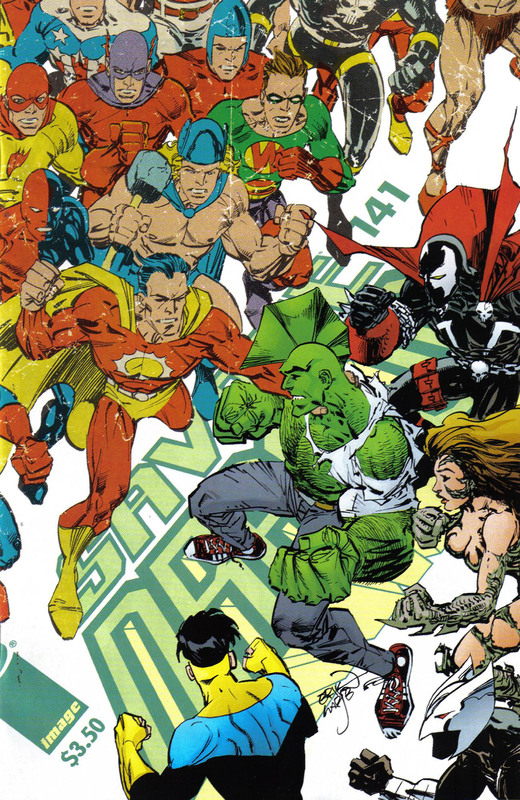 Dragon is punched to the ground by Solar Man who then claims that the heroes should not be fighting him as they should all be working together to eliminate murderers and assassins like Spawn. Invincible strikes out at Solar Man in an effort to protect Witchblade but she is thrown at him. This distraction has allowed Spawn to replenish his energy levels and he joins the fray. In the Citadel of Seclusion, the robotic guardians are fended off by the two intruders as they are thankfully nowhere near the power levels of their creator. A trophy room is revealed when ShadowHawk avoids a punch which opens up a hole in a wall. He looks through this chamber and locates a device labelled as an electronic disruptor and fires it. The weapon works too well as Rex Dexter is affected too, joining the Solar Man Robots in shutting down. ShadowHawk searches through the rest of the trophies and finds a magic charm which he gambles will serve as a weakness to Solar Man. Witchblade attempts to unleash her magical attacks upon Solar Man but his super-speed again enable him to avoid these blasts. Solar Man grows tired of the conflict and hits his fists together which creates a shockwave that destroys the building they are fighting inside. ShadowHawk catches up to his fellow heroes and unveils the charm but Solar Man laughs it off as a threat to him. The combined heroes continue their onslaught and ShadowHawk innocently wishes that they would always show up whenever he is in trouble as they make a formidable unit. After coming back online, Rex Dexter explores the Citadel of Seclusion some more and hears a noise coming from the basement. He comes across a huge chamber that he suspects is containing a threat capable of slowing down Solar Man. Rex risks unleashing a greater menace but opens up the chamber, liberating an army of superheroes that have been lost since the end of World War II. Inside the Danger Zone, Battle Girl finally gets to pay a visit to her friends there but is alarmed by the mess surrounding Red Giant and Star’s home. Alex Wilde accompanies the young hero and as they enter the building they are greeted by a sight which shocks them both. The fight with Solar Man continues with Invincible being punched right into a building filled with innocent people, killing many of those inside. Spawn believes that their foe is finally weakening but Witchblade is not quite so sure after witnessing how easily Invincible was disposed of. Dragon moves in behind Solar Man and delivers a punch that horrifies everyone when it completely destroys the head of his foe. The news crews filming the carnage take explicit footage of the killing as the crowd watching on are gripped with horror at Dragon’s actions. Dragon tries to explain that he had no idea that Solar Man was suddenly vulnerable just as all of the Golden Age superheroes arrive on the scene. They seek to avenge the death of their friend and attack the modern day heroes. Rex Dexter catches up with the men and women that he had just released and ends the fight, explaining to the Golden Agers that Solar Man had betrayed them all. He had locked them away, turning them into energy that he then used to augment his powers. With the danger having passed, Spawn and Witchblade depart before the authorities arrive to avoid any further incidents with the police. ShadowHawk reveals to Dragon that it had been a thrill to get to work alongside him before he too departs. Invincible offers to give Dragon a lift elsewhere but he opts to remain behind to explain his actions to the reporters present. In the aftermath, former talk show host Harry Paratestees exploits the situation to kickstart a career as a stand-up comic. He revels in the fact that Dragon has become a figure of hatred after the hero had cost him his previous job.